Mr. P has a history of progressive pain in both the knee and ankle over the past few years, resulting from lateral knee osteoarthritis (OA) and adult acquired flatfoot deformity. He is aged 61 years and significantly overweight (6 ft, 2 in, 282 pounds). He is not diabetic but has a diagnosis of atrial fibrillation and has been taking warfarin for years. He avoids exercise at all costs. He has tried numerous types of orthotic devices without relief of his symptoms. He is not interested in physical therapy. Weightbearing anterior-posterior radiographs of his knee, ankle, and foot are depicted in Figure 1. Mr. P’s symptoms, clinical findings on physical examination, and radiographs make him a reasonable candidate for total knee arthroplasty, hindfoot reconstruction, or both. In the current environment of evidence-based medicine, do the data give us any guidance as to whether we should approach surgical reconstruction of the foot and ankle, advise knee arthroplasty, or plan staged surgeries? If we recommend staged surgeries, which deformity should be tackled first? Mr P’s combination of end-stage knee arthritis and acquired flatfoot with arthritis of the peritalar joint complex is not uncommon. However, very little attention has been paid to management of such obviously linked conditions. Several important considerations should be addressed before formulating a treatment plan. Professional educational societies, regulators, and insurance providers all stress the necessity of an evidence-based approach for both diagnosis and therapeutic recommendations. The first issue to address is the question, though the answer may be intuitively obvious, of whether foot deformity and/or arthritis are linked to knee arthritis and/or deformity. Figure 1. Weightbearing radiographs of the knee and ankle in Mr. P.
Excessive loading at the knee associated with knee OA is typically discussed in terms of the proxy measure of knee adduction moment. The key components of the knee adduction moment are the vertical ground reaction force (GRF) vector that extends from the ground through the foot and the knee joint and the perpendicular lever arm that increases in length as the GRF vector passes further from the knee joint center.1 Because the GRF vector passes through both the foot and the knee, changes at one of those two joints will affect the other. Researchers at the Massachusetts General Hospital Institute of Health Profes­sions recently documented the relationship between foot morphology and knee OA.2 They evaluated almost 2000 patients whose average age was slightly younger than 70 years; 22% of the patients reported medial compartment knee pain most days. Cartilage damage was identified on magnetic reso­nance imaging (MRI) scans in 45% of medial tibial condyles, 27% of lateral tibial condyles, 58% of medial patellofemoral joints, and 42% of lateral patellofemoral joints. Using the Staehli arch index, they determined that patients with pes planus had 1.3 times the odds ratio (OR) of reporting knee pain and 1.4 times the OR of having identifiable medial tibiofemoral cartilage damage on MRI. Increasing pes planus severity was linearly associated with increased knee pain and medial tibiofemoral cartilage damage. These findings are consistent with those of an Australian study in which 32 patients with medial compartment knee OA had significantly greater evidence of de­creased longitudinal arch parameters than 28 healthy controls.3 The authors hypothesized the changes in foot morphology may have developed as a means of compensating for the increased adduction moments associated with medial knee OA, but noted there is likely a limit to the potential effectiveness of this type of compensation. Other research suggests that foot position during gait may also affect knee adduction moment. For example, a gait study from the Department of Physical Therapy at Northwestern University associated out-toeing with decreased progression of knee arthritis during an 18-month period.5 A greater toe-out angle theoretically reduces knee adduction moment by moving the GRF vector closer to the knee joint center. Further evidence of the relationship between the foot and knee in patients with knee OA comes from studies that have found both distal and proximal interventions effectively reduce the knee adduction moment.6 Early symptoms associated with valgus loading of the foot and ankle are addressed with prefab­ricated or custom foot orthoses, fol­lowed by short semirigid or hinged ankle-foot orthoses. At our center, we similarly address these forces at the knee level with offloading hinged knee orthoses. Whether we attempt to unload the forces distally at the level of the foot and ankle, or proximally at the level of the knee, the objective is to centralize the loading vector to a more normal, nonpathologic orien­tation. The majority of studies have focused on patients with OA in the medial tibo­femoral compartment of the knee, which is the compartment most often affected by OA.7 Some evidence suggests the kinematics of adult ac­quired flatfoot deformity are more likely to be asso­ci­ated with those affecting the lateral compartment of the knee. Specifically, rear­foot eversion has been associated in separate studies with both posterior tibial tendon dysfunction8 and knee valgus;9 knee valgus alignment is typical of lateral compartment knee OA. Surprisingly, a recent gait analysis study found that peak rearfoot eversion was higher in patients with medial knee OA than those with lateral knee OA, which the authors hypothesized might indi­cate a compensatory mech­an­ism.10 The patients in that study, however, did not have any foot or ankle symp­toms. The aforementioned GRF vector in the coronal plane that represents loading of the joints of the lower extremity is referred to as the weightbearing axis11 (Figure 2). The normal weightbearing axis passes through the center of the hip joint, the center of the knee joint (anterior tibial spine), and the center of the ankle joint. This normal alignment of the weightbearing axis is predicated on the calcaneus being positioned in a normal relationship to the talus and ankle. Posterior tibial tendon insufficiency, with the resulting acquired flatfoot deformity, is characterized by a lateral displace­ment of the calcaneus relative to its normal relationship to the talus and ankle. This lateral displacement of the heel causes the vector of the weightbearing axis to be shifted laterally relative to its normal position during stance phase of gait (Figure 3). From the knee arthroplasty surgeon’s perspective, lateral displacement of the weightbearing axis applies an increasing valgus load on the knee, ankle, and subtalar joints. This has the undesirable effect of overloading the lateral aspects of these joints and underloading the structures on the medial side of the loading vector/weightbearing axis. These types of malalignments make patients more prone to premature degeneration (i.e., arthritis) in the overloaded joints.11 These abnormal loading forces are further accentuated when the evolving knee arthritis leads to a progressive knee valgus deformity. Figure 3. Weightbearing axis in Mr. P. Note that the valgus deformity at the foot and ankle level allows the weightbearing axis to pass lateral to the normal knee center through the lateral joint compartment. Coupled motion at the ankle and subtalar joint complexes allows us to walk on uneven surfaces, and this motion may also play a role in the gait of patients with knee OA after undergoing arthroplasty.13 Investigators from both the knee reconstructive and foot and ankle services at the University of Iowa presented a thought-provoking study on this topic at the 2012 meeting of the American Academy of Orthopaedic Surgeons. 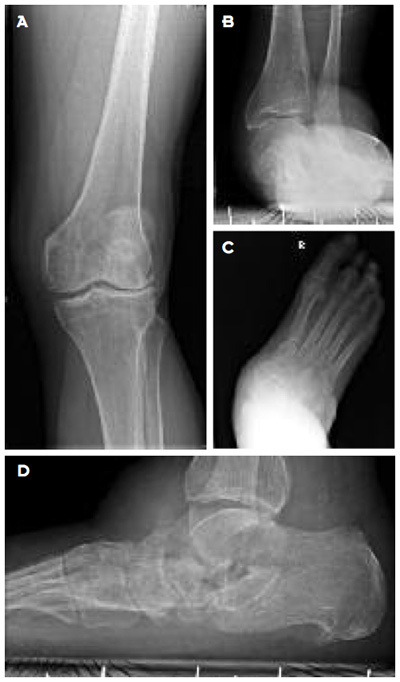 By comparing weightbearing radiographs of both the knees and foot and ankle complex before and after total knee arthroplasty, they demonstrated preliminary evidence that patients appear to compensate for weightbearing axis deformity at the level of the subtalar joint complex.14 These findings agree with those of a 2004 study of 100 cases of total knee arthroplasty, in which foot alignment, and hindfoot alignment in particular, significantly changed following surgery.12 Both groups of investigators recognized the linkage between knee alignment and foot and ankle complex deformity, but were not able to provide any guidance on treatment. Preliminary research on plantar loading after total knee arthroplasty has been similarly limited in terms of treatment implications. As previously described, earlier research reported a lateral shift in plantar pressures associated with medial knee OA, so one might expect that correcting the knee alignment in such patients would also correct foot loading. Our research thus far has not demonstrated this, however. We previously described a model, using pressure-sensitive mats, to objectively record loading of the foot during the stance phase of gait.15 In a study published in 2012, we used this model to analyze foot loading in patients undergoing total knee arthroplasty and found that correction of knee deformity led to no statistically significant change in loading pattern of the involved foot.16 However, it is important to note the patients in this study had only mild to moderate knee deformity; more pronounced effects of total knee arthroplasty on foot loading might be seen in patients who had more severe preoperative disease. The information from these preliminary studies would seem to suggest that, when treating patients such as Mr. P, surgeons should pay more attention to their feet before proceeding with knee replacement surgery. Figure 4. Improved alignment following knee replacement surgery. In patients with normal hindfoot alignment (i.e., a normal arch with normal hindfoot motion) the subtalar joint appears to compensate for mild to moderate knee joint alignment abnor­malities. These patients can undergo standard total knee arthro­plasty without concern for the foot. It is likely also true that foot alignment is not an important issue when patients have mild to moderate knee joint alignment deformity and asymptomatic foot and ankle deformity. 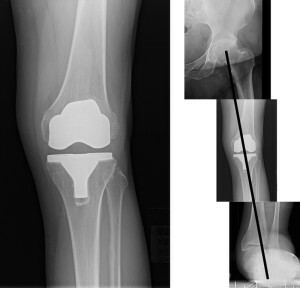 It appears that the compensatory capacity of the peritalar joint complex is sufficient to allow these patients to undergo knee arthroplasty without introducing alignment issues. Since the subtalar joint complex appears to compensate for some deformity, we advise using standard alignment landmarks in these patients without special consideration. The available evidence does not appear to provide any guidance for treating patients such as Mr. P. He has a both a symptomatic valgus knee arthritis deformity and a symptomatic rigid degenerative pes valgus deformity. The new information available from recent studies suggests it is reasonable to assume that severe arthritic foot and ankle deformity is likely responsible for some of the early failures observed in patients who had severe knee deformity prior to undergoing knee arthroplasty. Such patients do not have the capacity to “stress-dissipate” through their peritalar joint complex. This inability to offload malaligned forces is likely responsible for premature failure. Rather than rigidly advising a proximal-distal or distal-proximal approach, we advise initial treatment of the more symptomatic joint complex. If the foot-ankle complex is more symptomatic, we advise treatment with either hindfoot arthrodesis when the deformity and arthritis are below the ankle, or tibiotalocalcaneal arthrodesis when the ankle is severely involved. We then treat the knee arthritis as the second stage of treatment. When the knee arthritis is the primary symptomatic complaint (the more common clinical scenario), we first fit the patient for a custom or commercially available short ankle foot orthosis. Following the knee replacement, we monitor the foot-ankle complex during the perioperative period. In patients like Mr. P, who has severe ankle and hindfoot valgus, we tend to advise prolonged bracing of the ankle-foot complex, or surgery if or when the patient becomes sufficiently symptomatic. It is intuitively obvious to the thoughtful reconstructive surgeon that forces that act on the knee impact the foot and ankle complex, just as abnormal forces on the foot affect function of the knee. In spite of this obvious connection, little attention has been given to this type of linked problem in the orthopedic community. It is hoped that the preliminary investigations described in this article will stimulate thoughtful teams to collaborate and address this cross-discipline problem. Michael S. Pinzur, MD, is the chief of the Foot and Ankle Service at Loyola University Medical Center in Maywood, IL. William Hopkinson, MD, is the chief of the Adult Reconstruction Service at Loyola University Medical Center, where he specializes in adult hip and knee arthroplasty. Hunt MA, Birmingham TB, Giffin JR, Jenkyn TR. Associations among knee adduction moment, frontal plane ground reaction force, and lever arm during walking in patients with knee osteoarthritis. J Biomech 2006;39(12):2213-2220. Gross KD, Felson DT, Niu J, et al. association of flat feet with knee pain and cartilage damage in older adults. Arthritis Care Res 2011;63: 937-944. Levinger P, Menz HB, Fotoohabadi MR, et al. Foot posture in people with medial compartment knee arthritis. J Foot Ankle Res 2010;3:29. Lidtke RH, Muehleman C, Kwasny M, Block JA. Foot center of pressure and knee osteoarthritis. J Am Podiatr Med Assoc 2010;100(3):178-184. Chang A, Hurwitz D, Dunlop D, et al. The relationship between toe-out angle during gait and progression of medial tibiofemoral osteoarthritis. Ann Rheum Dis 2007;66(10):1271-1275. Raja K, Dewan N. Efficacy of knee braces and foot orthoses in conservative management of knee osteoarthritis: a systematic review. Am J Phys Med Rehabil 2011;90(3):247-262. Felson DT, Nevitt MC, Zhang Y, et al. High prevalence of lateral knee osteoarthritis in Beijing Chinese compared with Framingham Caucasian subjects. Arthritis Rheum 2002;46(5):1217-1222. Houck JR, Neville CG, Tome J, Flemister AS. Ankle and foot kinematics associated with stage II PTTD during stance. Foot Ankle Int 2009;30(6):530-539. Gross MT. Lower quarter screening for skeletal malalignment—suggestions for orthotics and shoewear. J Orthop Sports Phys Ther 1995;21(6):389-405. Butler RJ, Barrios JA, Royer T, Davis IS. Frontal-plane gait kinematics in people with medial knee osteoarthritis are different from those in people with lateral knee osteoarthritis. Phys Ther 2011;91(8):1235-1245. Oest O. Special diagnosis and preoperative planning of corrective osteotomies. In: Hierholzer G, Muller KH, eds. Corrective osteotomies of the lower extremity after trauma. Berlin: Springer-Verlag;1985:29-38. Chandler JT, Moskal JT. Evaluation of knee and hindfoot alignment before and after total knee arthroplasty: a prospective analysis. J Arthroplasty 2004;19(2):211-216. Saunders JB, Inman VT, Eberhart HD. The major determinants in normal and pathological gait. J Bone Joint Surg Am 1953;35(3):543-559. Norton A, Amendola A, Phisitkul P, et al. Lower limb alignment compensation of knee deformity occurs through the subtalar joint. Presented at the Annual Meeting of the American Academy of Orthopaedic Surgeons, San Francisco, February 2012. Voronov ML, Pinzur MS, Hoffman HH, et al. Static measure of foot loading. Foot Ankle Spec 2009;2(6):267-270. Voronov ML, Pinzur MS, Havey RM, et al. The relationship between knee arthroplasty and foot loading. Foot Ankle Spec 2012;5(1):17-22. I am very interesting in subject of knee joint osteoarthritis and I had wright a book about knee osteoarthritis modes of therapy, anyhow I believe it is of importance to deal with both disorders at the same time and I believe it wrong to deal with each one separatelly, thank you. I receive few orthotic consults for post op knee/hip replacements from orthopedists. But I receive far more referrals from the physical therapists who are rehabbing these post op patients. That pronation is overlooked as a major contributor to knee pathology and rehabilitation with or without surgery is not surprising judging from my experience. I fail to understand why this is overlooked.